Fallon 5-pc. Dining Set Sophistication is served. 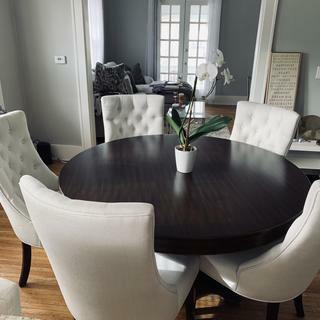 With upholstered button tufted chairs in white contrasting a rounded table base in dark wood, the Fallon 5-piece dining set is a daring approach to posh in the dining room. Comfortable, stylish seating invites dinner guests to linger long past the meal. They’ll bring their best manners to the table with a coordinating rounded base and cherry finish. Looks like the dining scene is just what you imagined: Simply elegant. Sophistication is served. 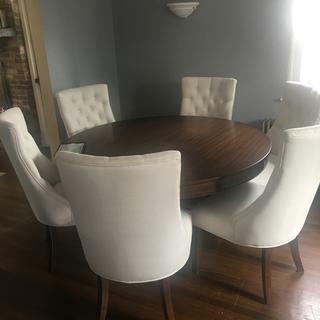 With upholstered button tufted chairs in white contrasting a rounded table base in dark wood, the Fallon 5-piece dining set is a daring approach to posh in the dining room. Comfortable, stylish seating invites dinner guests to linger long past the meal. They’ll bring their best manners to the table with a coordinating rounded base and cherry finish. Looks like the dining scene is just what you imagined: Simply elegant. L: 58" x W: 58" x H: 30"
L: 25" x W: 22.5" x H: 40.5"
Kiln drying removes moisture to protect furniture from changes in humidity that could cause splitting, warping and cracking; mango veneers add a beautiful grain pattern. Features a polyurethane-foam-padded seat and back covered in soft and durable, 100% polyester upholstery for a stylish finishing touch and extra comfort. Incredibly chic table with comfortable seating for six! Such a classy and elegant table! So hard to find a round table with more than 4 chairs. We bought extra 2 chairs and six people can sit very comfortably. The lazy Susan is a must and it's much cheaper with them than on Amazon. The chairs are very comfortable. Very easy to install so moving would be a cinch! It takes up only half of our dining room, so we can use the other half for our son's giant playpen. We are very happy with our purchase. product and service was great! Table and chairs were in great condition. The installers were on time and in and out . tbis dining room set looks fantastic. It really adds a contemporary high end touch to the dining room! We originally selected this table for our kitchen. After changing our color scheme, we chose this for our dining room. Looks fantastic, seats 4 comfortably and has plenty of room for your table settings. High quality piece. Highly recommend!! I am very particular about furniture being that I used to work in the industry. I was pleased with how clean and sturdy this set was. Love, love, love our Fallon set. It’s not only comfortable, but looks beautiful. This furniture is even more gorgeous in person! This dining set is so elegant and fits the space perfectly! This set brought classiness to my home without breaking the bank. Very well constructed and comfortable. Thank you Raymore and Flanigan , you never disappoint! I absolutely loved this table. It’s very classy. I received so many compliments on that. I would recommend it over and over again. So beautiful and comfy you can fit 8 chair of you need to. Only my concern is how can I protect table getting damaged? Thinking we might get a glass. For now I have 3 layers of table cloth while we are using.. I had been searching around for quite a while trying to find a dining room table that would match the china cabinet l already have, but never seemed to find anything worth buying until l walked into Raymour and Flanigan! 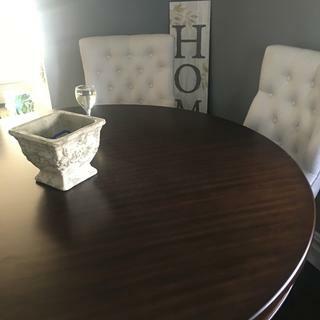 When my husband and l saw this dining room set, we knew right away it was the one we had to purchase because we both liked everything about it. The table is solid, and has a simple yet beautiful base. The chairs are sturdy and comfortable, and can hold a lot of weight. The design is timeless. We have kids, and were concerned about the light color, but that didn't stop us from purchasing it because we love it so much. We were shocked when we were told how much this set cost because it looks so elegegant that we thought it would be a lot more. The staff were also extremely helpful, and answered all of our questions. I am so happy we purchased this set because it looks amazing in our dining room. Do the chair covers come in other colors besides white? BEST ANSWER: The Fallon Dining Chair is available in white only. Can the table be purchased separately? BEST ANSWER: Yes. The Fallon Dining Table can be purchased individually. The SKU # is 799108165. Can the chairs come in a different fabric color? BEST ANSWER: The Fallon Dining Chairs are available in the Ivory color fabric only. How easy do the chairs clean up stains? Does the table have a leaf? BEST ANSWER: The Fallon dining table does not have a leaf. Is the chair fabric a velvet-like microfiber or a linen-look fabric? BEST ANSWER: The upholstery for the Fallon Dining Chairs are 100% polyester and would be considered to look more like a linen than a microfiber. What is the color of the wood is it a dark or light cherry?? BEST ANSWER: Hello Maria, thank you for your interest in the Fallon 5-pc. Dining Set! The wood finish is a dark cherry. Are the chairs sold separately? BEST ANSWER: The Fallon 5-pc. Dining Set includes a table and four chairs. Additional Fallon Dining Chairs can be purchased individually as well. The SKU # is 711108161. How long can you get a rebate if you drop the item to a lower price? BEST ANSWER: Please call 866-383-4484, option 3 for current promotions. Just want to make sure the base and table top are separated so it will fit thru 31 inches wide doirway?